We are Jelle de Bruijn & Martin Jaspers! We are both integration consultants and work together at the same company, QforIT B.V. in the Netherlands, a company specialized in process-, cloud integration and business intelligence. We both have a background in process integration and have been working with SAP Cloud Platform Integration intensively over the past two years. CPL232: Experience with SAP Cloud Platform Integration. We will not go in to too much technical details (no coding examples or programming language) but some experience with the topic would be useful. The session is not planned as a technical session, but rather as a session in which we want to share our experiences with SCP-I in the last 2,5 years. We are both SCP-I enthusiasts, so we can always go into technical details if required. We hope to give people insight in the world of SAP Cloud Platform Integration, how much fun it is to work with, how difficult it can be by sharing customer’s and our own experiences with practical examples and demonstrate cool things that SAP Cloud Platform Integration can do for customers and users. Q: Why should people come to your session? If you want to hear about real life experiences with SAP Cloud Platform Integration; how customers use it, how we use it, what kind of capabilities the product has, what it can do and what it can’t do yet; we ensure you that you are at the right session and we are looking forward welcoming you at our session at the SAP TechEd in Las Vegas! 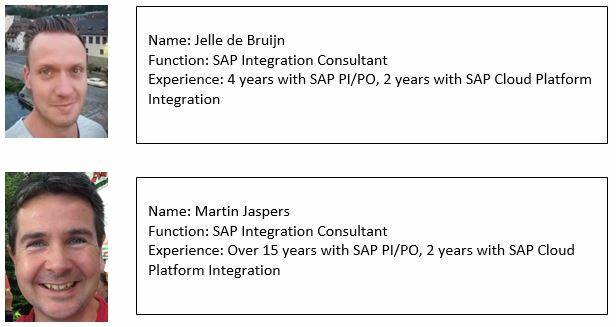 Hi Martin and Jelle , Looking forward to hear about your journey and experience with SAP CPI and see you at TechEd Las Vegas! We are also really looking forward to it and to meet with you in Las Vegas :)!